"Empathy is the ability to feel what others feel, to know another person's experience because you can connect it with your own. "Compassion is understanding what others feel and using that understanding to respond to them with love and kindness. "Empathy and compassion favor communication and social bonding. They strengthen community and mitigate interpersonal strife and violence. To hurt or kill another human being, one must first define that person as "other" - different from you in some essential way. Empathy prevents that." 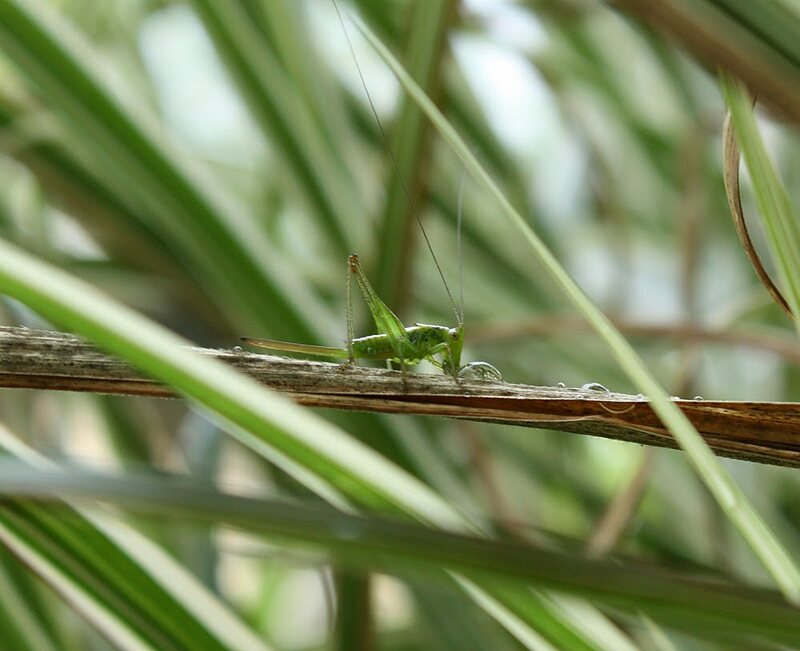 ________ Photo of katydid taking a drink this morning. Plenty of evidence for compassion & empathy, though I don't think they do a super-good job of establishing the link to spirituality or religion. Very touching photo, the koala. That was an interesting story, shaun. We have squirrels that will lick the mold that grows on our deck and then act as if they were high ... rolling around on the ground and jumping in the air. Regarding that Chimpanzee Religion Database ... I'm still trying to grasp the concept of Theory of Mind ... as applies to humans. That *is* an interesting link, Shaun. That's funny about the squirrels, Bix--I wonder what's in the mold. It would be interesting to have it analyzed. Accompanying Dr Weil’s quotation was is picture of a katydid, Dr. Mel mentioning bees and chimpanzees, a posted article about animals and healing, photos of koalas, and anecdotes of squirrels, but Dr Weil’s passage is quite specific to humans. Empathy does not “prevent” the hurting or killing of other humans. If it did, humans wouldn’t hurt and kill each other, and while we’re collectively a lot better off than we used to be as a species in terms of not hurting and killing each other (if you accept Steven Pinker’s thesis), at best, empathy and compassion are factors that can mitigate such behavior as the beginning of Dr Weil’s quote first established. But “prevent” is far too absolute a term considering there is a probably a human somewhere hurting and killing another human as I write this sentence. Empathy and compassion’s “preventing” of hurting and killing becomes even less credible if we consider the massive amounts of superfluous hurting and killing of other animals by humankind. The reason I’m being a stickler on this point is that while most humans have a natural capacity for compassion and empathy, it most certainly needs to taught though social education as well. It needs to be cultivated, practiced, and reinforced. Empathy and compassion need to be made meaningful and important in society. This takes persistence as we all have natural conflicting tendencies and competing forces to depress these virtues. Reified empathy and compassion doesn’t just happen. To presume that empathy and compassion prevents callousness and savagery as a matter of fact or faith is to do so at our own peril. It takes work. "We think of empathy and compassion as virtues, but they are also learnable skills." And he described various methods for cultivation. The quotes are from his new book that I'm inching through. I did like that "other" part of his quote. As I said, I'm still trying to grasp this Theory of Mind that Melinda's link talked about. I first heard about it in Ramachandran's book along with his topic of mirror neurons. Empathy, as I understand it, is related. You make a good point about them being taught. I think society would benefit from some formal discussion of them, maybe in school? I don't know, maybe they're already being addressed. For me, probably not a day goes by that I'm not presented with an opportunity to practice them. Everywhere I go on the internets someone is calling someone studip, or idiots, or morons, or worse. It's depressing. Where is the empathy and compassion. Why can't kindness be more important that being right.